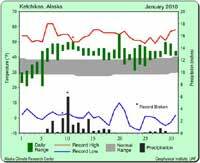 Ketchikan: Ketchikan's Weather Breaks Records in January - Ketchikan's weather is the highlight this January for Alaska, breaking two temperature records and two precipitation records. On Jan. 11 a high temperature of 50 degrees Fahrenheit tied the 1981 record high temperature, and on Jan. 20 the high temperature reached 55 degrees, breaking the old record of 51 degrees that had been set in 1995. Alaska: Denial of ConocoPhillips' permit by Corps of Engineers causes outrage - The US Army Corps of Engineers denied ConocoPhillips' application to build the bridges over the Colville River, in a decision Friday, saying other alternatives would meet overall project goals while better preserving marine wildlife. 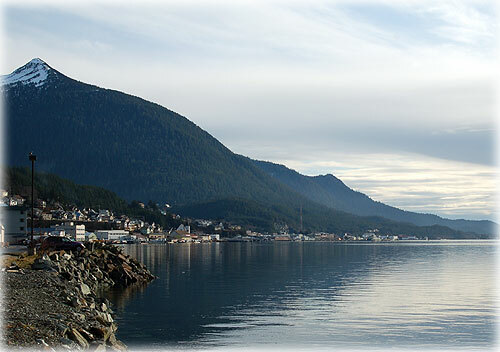 Alaska Governor Sean Parnell was outraged with the Corps of Engineers ruling. In a prepared statement released Saturday, the Governor said, "Just in the last six months, we've fought the federal government for tying up Outer Continental Shelf leasing, and for adding bureaucratic nightmares and costs with Endangered Species Act listings and critical habitat area designations. We've seen the U.S. Fish and Wildlife Service and the Environmental Protection Agency show reluctance to approve anything related to jobs in Alaska." "And then -- first, by delay, and now, through their decision -- the Corps of Engineers continues to set back our nation's chances for economic recovery, domestic energy production, and Alaskans' prospects for jobs." said Gov. Parnell. U.S. Sen. Lisa Murkowski (R-Alaska), reacted Friday to the Obama administration's denial of Conoco Phillips' permit to construct a bridge that would allow access to what would have been the first oil and gas lease in Alaska's National Petroleum Reserve (NPRA). The US Army Corps of Engineers is insisting the company instead use directional drilling for the development. Murkowski said in a prepared statement, "For decades, those who oppose developing ANWR or Alaska's offshore fields have continually cited the 23 million-acre NPRA as the area where development should occur instead. If a producer cannot get across the Colville River, however, NPRA's resources are effectively off-limits." Ketchikan: First Bank Donates Over $30,000 to KGH Foundation - Just over two years ago the First Bank Board of Directors pledged $100,000 to the Ketchikan General Hospital Foundation. That commitment, to be paid over a five-year period, is earmarked for the Endowment Fund. Left to Right: Gretchen Klein, Foundation Manager; Sheila Kleinschmidt, First Bank Assistant VP Community Relations; Butch Olmstead, First Bank VP Loan Administration; Kay Sims, First Bank Board of Directors; Sherrie Slick and Carolyn Wilsie, KGH Foundation Board; Kendall Sawa, KGH VP of Patient Care; Pat Branco, KGH CEO; Barbara Bigelow, KGH Manager Center for Healthcare Improvement; Judge Henry Keene, KGH Foundation Board and Dave Anderes and Mike Elerding, First Bank Board. This year the directors, officers and employees of First Bank presented not only the third annual $20,000 donation, but also an additional $10,950 contributed by First Bank employees and matched by their Board for the 2010 Gift of Healing campaign. The Endowment Fund has a one million dollar goal. When achieved, the interest will guarantee continued success providing funds for new technology and equipment. KGH Foundation Director Gretchen Klein reports the Endowment Campaign is at the mid-point. "We have raised just over $520,000 toward our goal. Despite this being a time of economic challenges, individuals and businesses continue to give top priority to having excellent local health care." This year's Gift of Healing project is a Minimally Invasive Surgical Suite. The project goal is $237,141, which will be used for equipment including several scopes, a monitor and an operating room table. Minimally invasive surgery is performed through small incisions through which a tiny camera and other instruments are inserted. The camera provides images to the monitor, which guides the surgeon. The new technology will provide superior diagnostic clarity that will improve the detection, diagnosis, and prognosis for some cancers and other diseases. It will reduce the need for more invasive surgeries in some cases and increase the range of services that can be provided locally. First Bank was an early partner in supporting the Foundation. In 2006, Bob St Clair, former First Bank Vice President/Manager of Electronic Banking, now retired, was one of the founding directors of the Foundation's Board. Through his employment with First Bank, he arranged for a few of the Foundation Board members to speak to First Bank's Board about the need for a Women's Diagnostic Imaging Suite, the first major Foundation project. That year First Bank gave almost $6,000 to the Foundation. Fish Factor: Less Pacific halibut for seafood buyers this year By LAINE WELCH - There will be a bit less Pacific halibut for seafood buyers this year, but the bite isn't as bad as the industry expected. The coast wide catch limit of 50.67 million pounds is nearly two million more than anticipated, although it is still a 6.4% decrease from 2009. The International Pacific Halibut Commission - which oversees fisheries on the west coast, British Columbia and Alaska - set the catch limits at its annual meeting last week in Seattle. Alaska always gets the lion's share of the halibut - the 2010 Alaska catch is 42.36 million pounds, a drop of 3.3 million from last year. The start date of the fishery is Saturday, March 6th - 15 days earlier than the 2009 season. That will get fresh, first of the season halibut to market just in time for Lent - the seafood industry's biggest sales season. Market watchers predict prices to fishermen will start out very high. That, of course, remains to be seen. The IPHC also took up proposals to change regulations at its annual meeting. A lot of time was spent on halibut sport fish issues, according to the meeting report. A proposal to create harvest tags for all recreational halibut fisheries in Alaska drew support, saying it would improve data collection. The Commission took no action on a proposal to change Alaska sport fish filleting requirements. It will, however, direct a working group to bring the issue back to the table next year. Commissioners said they want to see "more effective management" of the state's sport charter fishery. They said they will be closely monitoring the progress of proposed catch sharing plans. Alaska: Matanuska Returns to Fleet; AMHS Adjusts Vessel Schedules to Maintain Service - The Alaska Marine Highway System (AMHS) has altered various ferry schedules following the 47-year-old Matanuska's delayed return to service after about six weeks of vessel enhancement maintenance. Technicians recently completed installing a new electronic, controllable-pitch-propeller control system and extensive shafting, hub and propeller work along with routine overhaul maintenance aboard Matanuska in Ketchikan. Matanuska and its crew were originally scheduled to return to the fleet Feb. 2. The ship returned Feb. 5, after passing and completing a Coast Guard maintenance inspection.